Being that High Performance Alloys has made significant material contributions to the design of this powerful new fighter, we chart its course carefully and with a certain measure of “hometown pride.” After all, it’s our nitronic 60 that’s been utilized in the construction of these Joint Strike Fighters. With its superior wear resistance (along with other qualities), Nitronic 60 makes for an alloy that’s lightweight, flexible, and powerful all in one package. The R.A.F. now joins the U.S.A.F. as one of the most fearsomely advanced flying forces in the world. 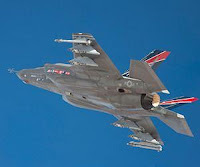 With other NATO countries slated to purchase the F-35, we look forward to further orders for nitronic 60, and an ever-more capable air arm for NATO.